Green apples, with their small percentage of sugar, always remind me of a fruit that is refreshing and cool. This summer recipe uses green apples in three forms—as gelato, a sauce, and as a decoration. Together, with a slightly alcoholic finish, they create an appropriate way to close a summer dinner of fish and vegetables. Wash the apples and cut into pieces while maintaining the skin. Put them in a blender along with the basil leaves, sugar, and lemon. Blend for a few seconds until a smooth consistency is obtained. Prepare the cups using a champagne glass. 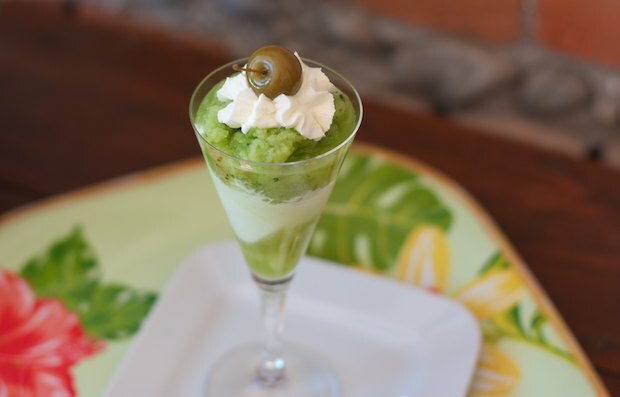 Pour in 1 tablespoon of alcohol from the Toschi green apples into each glass, then place a scoop of gelato and on top, and top with a spoonful or two of the apple mixture. Complete the preparation with a small Toschi green apple. Serve immediately.